New York, NY (MS. RAINE INC): Built in 1865 as the Drake Opera House, New Jersey’s Ritz Theatre has seen some of the biggest and best names in entertainment grace its stage, from Vaudeville comic legends George Burns and Gracie Allen, to country music idol Johnny Cash, and master Jazz trumpeter Miles Davis. On October 26th, the Ritz Theatre adds two more legendary figures to their repertoire, with the historic Reggae at the Ritz concert featuring Jamaican music icon Buju Banton and reigning Dancehall superstar Mavado. Presented by Road Block Radio, Race Entertainment, and CCB International, Reggae at the Ritz bridges the gap between the grassroots ‘Roots Rockin’ vibe of Reggae and the elegant and elaborate presentation of classic theatre. 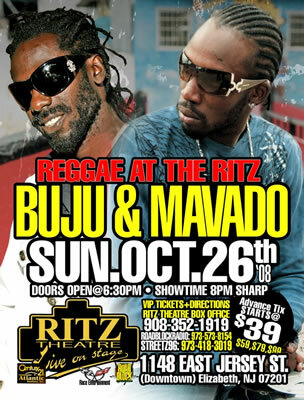 The Ritz has high expectations for their debut Reggae staging, particularly with Buju Banton and Mavado as headliners. “We are really proud to have them perform at our theatre,” states Ritz Theatre House Manager Anna Urbas. Urbas maintains that while all of the Caribbean music acts presented at the Ritz been Spanish-speaking, the Ritz theatre is eager to tap into the Tri-State area’s blossoming English-speaking Caribbean population. Hailed by Rolling Stone Magazine as the ‘best Reggae artist since Bob Marley,’ Mavado, has earned international attention with biting street anthems like “Weh Dem A Do,” “Last Night,” and “Gully Side.” Mavado’s debut album Gangsta For Life: The Symphony of David Brooks spent 48 weeks on the Billboard’s Top Reggae Albums chart, while his latest hit singles “So Special” and the “On the Rock” remix with Hip Hop mogul Jay Z, are currently in heavy rotation on mainstream stations around the globe. Reggae at the Ritz featuring Mavado and Buju Banton will be held at the Ritz Theatre (1148 East Jersey Street) in Elizabeth, NJ. The event will be hosted by Dahved Levy of WBLS 107.5FM, and Banky Hype and Greng Greng of RoadBlockradio.com. Music will be provided by Mister Cee of Hot97 FM and the Road Block Radio family. Advance Tickets are $39, $59, $79, and $99. For ticket information, go to www.ticketweb.com. For VIP Tickets, call 908-352-1919 or 973-573-8154. For a full listing of ticket outlets, log on to www.roadblockradio.com, or call 973-573-8154 or 973-416-5306.